In that 10-page prologue, Orange wittily and witheringly riffs on some 500 years of native people's history, a history of genocide and dislocation presented mostly through the image of heads. He begins with a description of the "Indian Head test pattern," a graphic that closed out America's television programming every night during the age of black-and-white TV. He then catapults backwards to 1621 and the first Thanksgiving, then bebops through a litany of Indian massacres in American history. Our heads are on flags, jerseys, and coins. Our heads were on the penny first, of course, the Indian cent, and then on the buffalo nickel, both before we could even vote as a people — which, like the truth of what happened in history all over the world, and like all that spilled blood from slaughter, are now out of circulation. In his prologue and in other inspired digressions throughout this novel, Orange's writing reminds me of the late, great Tom Wolfe — another exuberant, socially conscious prose poet who loved to get word-drunk but never got sloppy. There There is distinguished not only by Orange's crackling style, but by its unusual subject. This is a novel about urban Indians, about native peoples who know, as he says, "the sound of the freeway better than [they] do rivers ... the smell of gas and freshly wet concrete and burned rubber better than [they] do the smell of cedar or sage..."
Orange's story takes place in Oakland, Calif., and his title comes from the famous pronouncement about rootlessness that Gertrude Stein made when, as an adult, she revisited Oakland, her childhood home. "There is no there there," Stein said. Orange knows the feeling and the terrain: He also grew up in Oakland and is enrolled in the Cheyenne and Arapaho tribes of Oklahoma. But in There There, Orange wanted to do something more than fictionalize his own experience. Instead, his novel is composed of the stories of a bunch of Native and mixed-race characters, all of them eventually converging in a climactic scene at a big powwow in the Oakland Coliseum. We readers know from the outset that something terrible will happen at that powwow the minute we meet our first character, 21-year-old Tony Loneman. Tony talks about struggles with the "Drome," meaning fetal alcohol syndrome, and is in with a bunch of lowlifes who've gotten a hold of 3-D printed plastic guns they're planning to use in a robbery at the powwow. Other, more benign characters are drawn to the powwow for the same reasons that Americans of every race and ethnicity now log onto sites like Ancestry.com: They're searching for identity. That urge is especially strong in characters whose connection to their native heritage is more vexed, like a young woman named Blue, who was adopted at birth by a white couple. She's what Orange calls in his prologue "an apple," meaning "red on the outside and white on the inside." The risk with this kind of chorus-line plot structure is that it can feel mechanical — as Orange's novel sometimes does when it stalls in the company of the weaker characters here. But other voices and stories are so alive they more than compensate. Chief among the standouts is a woman named Opal Viola Victoria Bear Shield whose background is as singular as her name. As children, Opal and her older sister spent time with their mother on Alcatraz, when that island was occupied by Native American activists in 1969. In present-time, Opal is now a postal worker, caring for her sister's three grandsons. All of them find themselves at that fateful powwow, which turns out to be as chaotic and idealistic as the Alcatraz occupation — and much more violent. In a satiric aside, Orange says that one thing that unites the diverse powwow participants is the type of bumper stickers they've slapped on their cars: They all sport Indian pride messages like "My Other Vehicle Is a War Pony" and "Fighting Terrorism Since 1492." Like those bumper stickers, There There is pithy and pointed. With a literary authority rare in a debut novel, it places Native American voices front and center before readers' eyes. This is FRESH AIR. A debut novel with an odd title has become one of the first breakout literary novels of the summer. Our book critic Maureen Corrigan has a review of "There There." 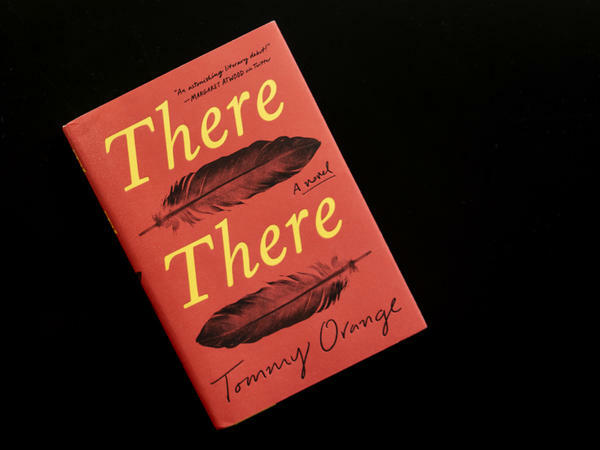 MAUREEN CORRIGAN, BYLINE: Here's the thing about "There There," the debut novel by Native American author Tommy Orange. Even if the rest of its story were just so-so - and it's much more than that - the novel's prologue would make this book worth reading. In that 10-page prologue, Orange wittily and witheringly riffs on some 500 years of native peoples' history, a history of genocide and dislocation presented mostly through the image of heads. Orange begins with a description of the Indian head test pattern which closed out America's television programming every night during the age of black-and-white TV. He then catapults backwards to 1621, the first Thanksgiving, and then bebops through a litany of Indian massacres in American history. Here's part of that prologue where Orange momentarily catches his breath and sums up. (Reading) Our heads are on flags, jerseys and coins. Our heads were on the penny first, of course, the Indian cent, and then on the buffalo nickel, both before we could even vote as a people - which, like the truth of what happened in history all over the world and like all that spilled blood from slaughter, are now out of circulation. In his prologue and in other inspired digressions throughout this novel, Orange's writing reminds me of the late great Tom Wolfe, another exuberant, socially conscious prose poet who loved to get word drunk but never got sloppy. "There There" is distinguished not only by Orange's crackling style but by its unusual subject. This is a novel about urban Indians - about, as he says, native peoples who know the sound of the freeway better than they do rivers, the smell of gas and freshly wet concrete better than they do the smell of cedar or sage. Orange's story takes place in Oakland, Calif. And his title comes from the famous pronouncement about rootlessness that Gertrude Stein made when, as an adult, she revisited Oakland, her childhood home. Stein said, there is no there there. Tommy Orange knows the feeling and the terrain. He also grew up in Oakland and is a member enrolled in the Cheyenne and Arapaho tribes of Oklahoma. But in "There There," Orange wanted to do something more than fictionalize his own experience. Instead, his novel is composed of the stories of a bunch of native and mixed-race characters, all of them eventually converging in a climactic scene at a big powwow in the Oakland Coliseum. We readers know from the outset that something terrible will happen at that powwow the minute we meet our first character, a 21-year-old named Tony Loneman who talks about struggles with the Drome, meaning fetal alcohol syndrome. Tony is in with a bunch of lowlifes who've gotten a hold of 3-D plastic guns they're planning to use in a robbery at the powwow. Other, more benign characters are drawn to the powwow for the same reasons that Americans of every race and ethnicity now log on to sites like ancestry.com - they're searching for identity. That urge is especially strong in characters whose connections to their native heritage is more vexed, like a young woman named Blue, who was adopted at birth by a white couple. She's what Orange calls in his prologue an apple, meaning red on the outside and white on the inside. The risk with this kind of chorus-line plot structure is that it can feel mechanical, and Orange's novel sometimes does when it stalls in the company of the weaker characters here. But other voices and stories are so alive they more than compensate. Chief among the standouts is a woman named Opal Viola Victoria Bear Shield, whose background is as singular as her name. As children, Opal and her older sister spent time with their mother on Alcatraz when that island was occupied by Native American activists in 1969. In present time, Opal is now a postal worker caring for her sister's three grandsons. All of them find themselves at that fateful powwow, which turns out to be as chaotic and idealistic as the Alcatraz occupation and much more violent. In a satiric aside, Orange says that one thing that unites the diverse powwow participants is the type of bumper stickers they've slapped on their cars. They all sport Indian pride messages, like my other vehicle is a war pony and fighting terrorism since 1492. Like those bumper stickers, "There There" is pithy and pointed. With a literary authority rare in a debut novel, it places Native American voices front and center before readers' eyes. GROSS: Maureen Corrigan teaches literature at Georgetown University. She reviewed "There There" by Tommy Orange. Tomorrow on FRESH AIR, our guest will be David Sanger, author of "The Perfect Weapon: War, Sabotage And Fear In The Cyber Age." He writes about the Russian hacking of the DNC, digital sabotage from Russia, China, Iran and North Korea and how the U.S. is trying to defend itself. Sanger is a national security correspondent for The New York Times. I hope you'll join us. (SOUNDBITE OF BRAD MEHLDAU'S "HAPPY TUNE") Transcript provided by NPR, Copyright NPR.